A title is the most important part of a blog post. Visitors will see the post name first. If it found interesting, they will open the page for further reading. So your title should be unique, interesting and contain necessary keywords to represent the post. Is it possible to give different titles for the same blog post – on the website, Facebook, Twitter and search results? Today we’re going to tell you how to customize your blog post titles with Yoast SEO and Rank Math SEO plugins. After drafting your post, scroll down to view Yoast SEO on-page settings. It will show Snippet preview as the first option. Tap ‘Edit snippet‘ button to change the title for search engines. Type your desired title. As I said earlier, it should contain all major keywords and able to divert visitors to your content. There are some set of words, which can be used in post titles for better results. How to, top 10, 10 best, ultimate guide etc can bring more traffic to your pages than common titles. 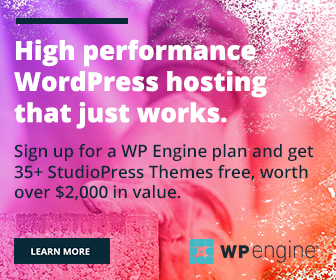 Top 10 best productivity apps for bloggers, How to configure W3 Total Cache Plugin (An Ultimate Guide) are perfect examples for this strategy. Tap Social tab from the left pane of Yoast SEO plugin to customize Facebook and Twitter posts. Initially, give the desired title and description for your Facebook posts. 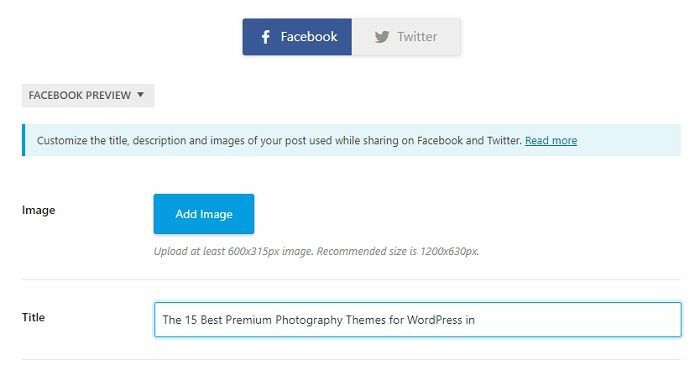 If you want to use a particular image other than featured one, upload it via Facebook Image option. Repeat the same process for Twitter too. Fill all other fields in the SEO section followed by choosing categories and tags for the post. Once you finished, hit the Publish button. Rank Math is a newly launched premium quality SEO plugin from MyThemeShop. It can optimize your website and contents for search engines, and social media sites to divert more traffic to them. Once you finished writing in the WordPress post editor, scroll down to the bottom to find on-page SEO settings of Rank Math. Click the ‘Edit Snippet‘ button to change your post title for search engines. Enter your new title in the text box. It will appear in the preview as you type along with the recommended character limits. Search engine users can see only up to 60 characters in the results. So it’s better to give keyword-rich normal lengthy titles for your posts. Click the Social tab to customize your content titles for Facebook and Twitter. Enter your title for each network. Upload a custom image and write a custom meta description if needed. Click the Preview button to view social media preview of your post link. By default, Twitter cards will collect data from your Facebook tab. So you need not customize Twitter links individually. But Rank Math allows you to customize Twitter cards also. 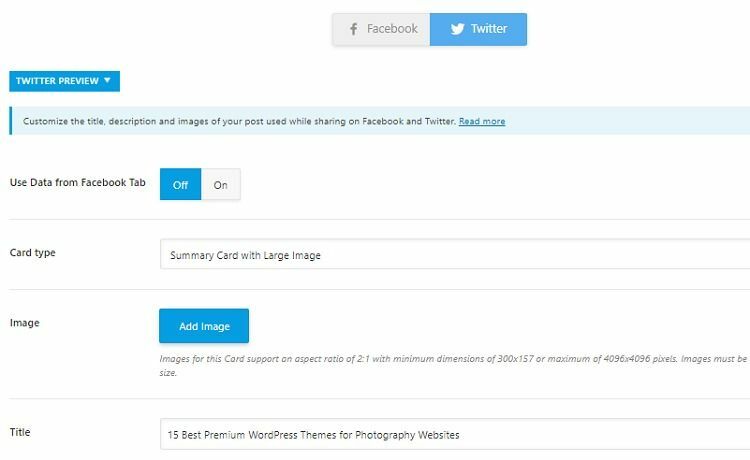 Turn ‘Use Data from Facebook Tab’ off to manage your post title, thumbnail image, and description for the micro-blogging site. Click Publish button when you finished optimizing the content.